The history of the Chinese Happy Buddha can be traced back to the Bodhisattva Maitreya, the Buddha that is predicted to succeed Gautama Buddha, the founder of Buddhism. 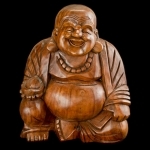 The names Chinese, Smiling, Fat, Laughing or Happy Buddha are just Western names for this figure. They represent the later Buddhist notions that the good life was indeed attainable in this world. It consisted of self-mastery, a happy demeanour, purposeful endeavour, a deep commitment to the welfare of others and enlightened awareness. Whatever the actual origins, history records that his influence has been tremendous. Buddhism, Taoism and Zen Buddhism have all embraced the Happy Buddha as the embodiment of happiness and prosperity. His influence can be felt in China and Japan, and other countries where Buddhism and Taoism have taken root. 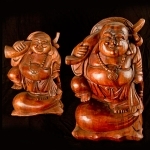 Folk law statues and figures all embody the ideals of the good life: health, happiness, prosperity and longevity.